Margaret Schankler, chief purveyor over at Oliebollen.com, sent me an email asking me to check out her store. Normally when people send me these kinds of requests I ignore them, but Oliebollen is one of those names I've heard before, so I checked it out. It seems like a pretty cool online kid's boutique. They've got tons of clothes (which, unless it's novelty onesies, I find hard to shop for online), as well as toys, gear and furniture. Plus it's mom-owned and operated, which has to count for something. But to be honest, the main reason I'm blogging about her store is she sent me a coupon code to use - BLOGMAY31 - which gets you 20% off any and all items on a single order placed before 6/15/05. It's a pretty good deal, especially on the bigger items. 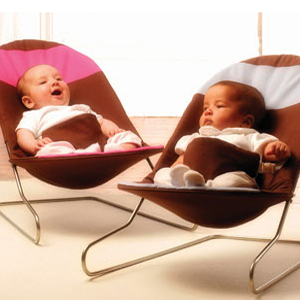 20% off can get you that sweet Oeuf Crib for $659.20, or the Oeuf Baby Lounger (pictured) for $78.40. I'm not getting any kickbacks here (and I can't personally vouch for the store), but a good deal is always worth sharing. Use coupon code BLOGMAY31 at Oliebollen.com now through June 15.